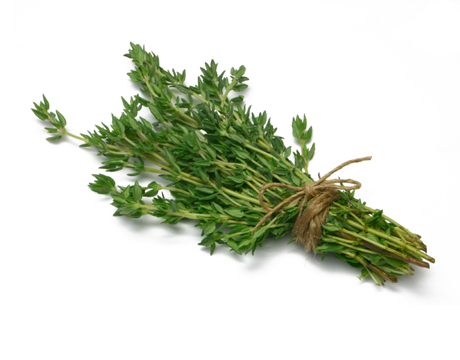 Wrap thyme loosely in plastic wrap and place them in the warmest part of the refrigerator; one of the compartments in the door works perfectly. Do not wrap the herbs tightly or the trapped moisture may cause them to mold prematurely; many people like to add a crumpled paper towel to the bag as a safeguard. Do not rinse the herbs until just before using. Thyme is a good source of Vitamin E (Alpha Tocopherol), Thiamin, Magnesium, Zinc and Copper, and a very good source of Dietary Fiber, Vitamin A, Vitamin C, Vitamin K, Folate, Calcium, Iron and Manganese. Use thyme in soups, chowders, stuffings, fish dishes, tomato juice, in cheeses, with carrots, celery, mushrooms, tomatoes, zucchini, potatoes, and beets. Add a small amount of thyme to your favorite bread and biscuit doughs. Good with vegetable and rice soups.